Beyond Definition | What Smells So Good? The idea of what exactly defines "Canadian cuisine" is a bit of a mystery. I mean sure, you have the butter tarts, the Nanaimo bars, the Kraft Dinner and the dill pickle potato chips, but do you ever hear of a great restaurant to hit for "Canadian food"? I know there isn't a Canadian section in our Yellow Pages restaurant directory, and even places known for serving home-grown fare fall back on the stereotypical maple syrup, wild game, salmon and cranberries to flesh out their menus. And really, I can't blame them. Picking one or two iconic items out of a host of beautiful, fresh offerings and selling them as what that area "is" is easier than trying to explain the intricacies of the treasures that exist. The problem, then, is that those "hidden" gems get far too forgotten in the shuffle and are rarely seen even when they are at their peak. For instance, Georgia's peach and pecan harvest might as well be the only thing they do produce as far as the general public's knowledge goes - nevermind that they also produce fabulous turnip and parsnip crops and that they even have a fig season! So today, in celebration of Canada Day (and my blog's 3rd birthday! ), I wanted to take a coast to coast look at all that Canada has to offer the world of cuisine and combine it into a mosaic just as beautiful and intricate as the country itself. I already had a plethora of B.C. blueberries in my freezer that I really wanted to use as a yeast bread filling somehow, and I had been playing with the idea of using the last of a bag of Manitoban wild rice in bread too. I covered the tiny province of P.E.I. by adding potato flakes to the dough, which also tenderized the hearty, dense crumb created by Ontario-grown Red Fife flour and soy milk powder. 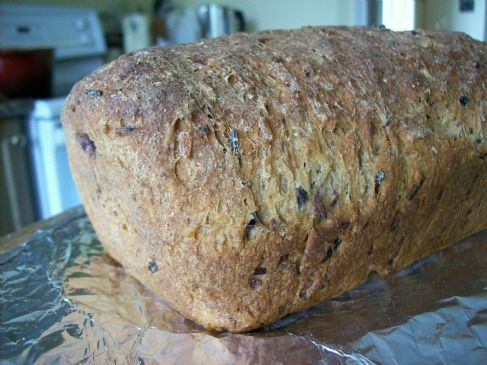 Finally, I laced the bread with cranberry juice from the Ottawa valley, canola oil from Alberta and flax seed from the Maritimes. While I didn't get to cover the territories, and the Quebec maple syrup I would have used was no longer around, I think I did my country proud. This bread is dense (as most whole wheat loaves are), but it's moist and tender at the same time. The filling is unsweetened, relying on the natural sugars in dried dates and the berries themselves to cook into a semi-caramelized mash that spreads easily. The dough is loaded with soft bites of rice and just enough ground cinnamon and nutmeg to play up the rest of the ingredients. I'm sending this along (with a happy Canada Day wish) to Susan's YeastSpotting this week. Combine berries, dates and water in a small saucepan and place over medium heat. Cook until berries are very soft, about 10 minutes, then roughly mash the mixture with a fork. Continue cooking until the berries have a jam-like consistency, about 10 minutes. Remove from heat and cool completely before using it (you can also make this 2-3 days in advance and store, covered, in the refrigerator). In a large bowl (like these from Chef's Catalog - the Foodbuzz Daily Special), combine flours, gluten, potato flakes, soy milk powder, flaxseed, salt, cinnamon, nutmeg, orange zest and yeast, whisking well. In a bowl or measuring cup mix together sugar, water and cranberry juice. Stir into the dry ingredients and mix for 5-7 minutes, then cover and allow to rest 5 minutes. Beat in the oil and continue kneading 10 minutes. Re-cover and allow to rest 5-10 minutes. Turn out onto a lightly greased countertop and knead in the rice mixture - it will all eventually fit, even though it doesn't appear that way! Place into an oiled bowl, cover and rest 30 minutes. Roll dough out into a rectangle with it's "short" side the length of the loaf pan. Spread with an even layer of the blueberry mixture and roll up, jelly-roll style, continuously tucking the edges in to prevent leakage. Place into a greased loaf pan. Cover and allow to rise until almost double, about 1 hour. Bake loaf 35 minutes, then cover top with foil and bake a further 15 minutes. Looks delicious! Canadian cuisine is similar to Minnesota cuisine. Emphasis is typically on Walleye fish, wild rice, and blueberries. Oh and "hotdish" (a colloquialism), which the rest of the U.S. refers to as "casserole". The bread looks delicious, I love the swirl! Happy 3rd birthday blog!! My gosh you must have been up early to bake! Ooo, this is an even healthier twist on a cran-blueberry style loaf I already love. I think I may have to try this one!